Of the 15 teams, five are old and the rest are new to this season, including the Útulangivaka team. “I was excited to join when Útulangivaka girls put in a team for this league,” said Fololeni Naitingikeili Siale, a national player who moved from Tongatapu and stayed in this part of Neiafu. “This new league is a great outlet, particularly for less experienced players or those who just want to be involved with a team, where you can have fun and really enjoy the game, without feeling intimidated. “Our first match was so much fun, getting back on the field again, cheering on all of our teammates and representing our respective vilage, Útulangivaka. We also have one coach who have prepared us for our first match, while continuing to motivate us to improve for the rest of our matches in this new league season,”she added. “After representing Tonga in 2010 then I moved town to Vavaú and now I’ve settled here and I’m so excited to go back to play.’’ Fololeni added. Other new teams in the league are the Moli Fie Tuí from Feletoa, Taáne, Okoa, Koloa, Haákio, Makave, Holonga, Tuánekivale and Queen Vanilla. The 15 teams are divided into two pools, Pool A and Pool B and play round-robin matches within their respective pools. Matches are played every Saturday and Wednesday and continue through to June 13 for semi final and final the following week. 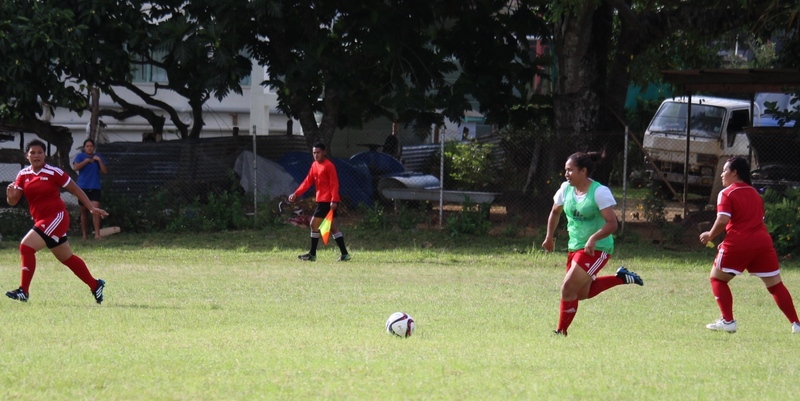 “I’m pleased to see the continuous growth of this league since women’s football played in the Vavaú Football’s League in 2013,” said Manatu Liavaá, VFA women’s football administrator. Next PostThree Main Districts One day Tournament in Tongatapu! Three Main Districts One day Tournament in Tongatapu!